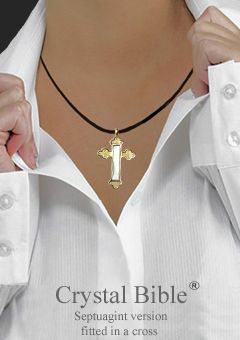 Our beautifully crafted Crystal Bible® cross pendants are attractive for their slim design and reasonable price. 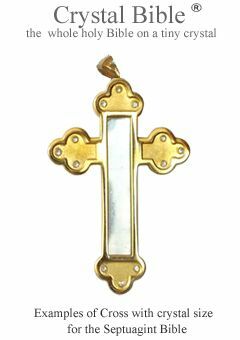 This premium line of Cross pendants are cast by hand and are of the highest quality made in silver metal, or metal with yellow gold or silver tone. will be delivered In full set with the DVD. 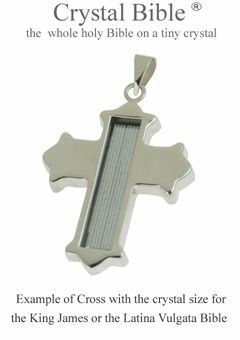 This is truly the most wonderful Christian pendant on the market and makes a very unique Christian gift for any occasion. 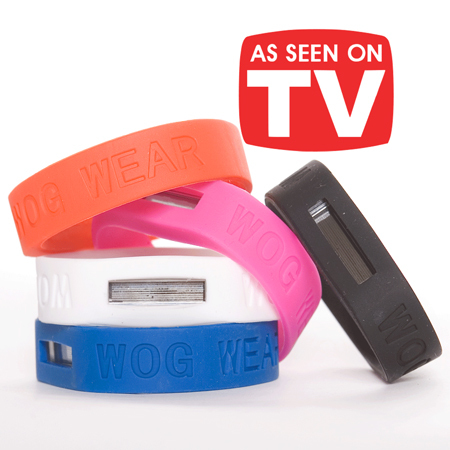 This product range is under production development, to be informed, click on the button at the right. 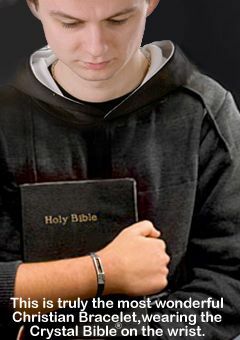 The Crystal Bible® alone. Use to mount it in your own special item. You can check your jeweler for doing your own pendant. 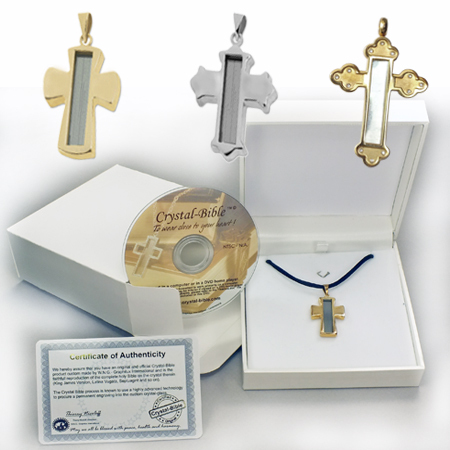 All of these products are available in bulk order and for retail quantity please contact us "here"
A beautifully crafted Crystal Bible® embedded into a special designed mini book. 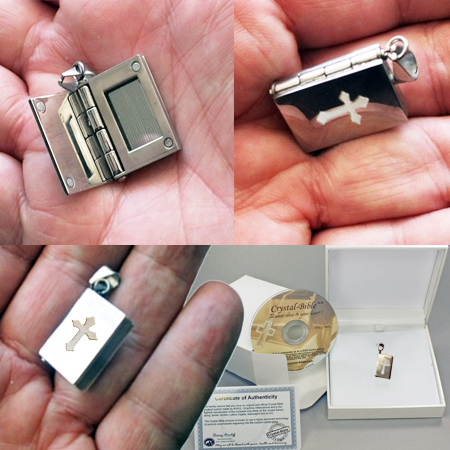 This very original micro sized Bible item is fitted in a Bible mini book design made in stainless steel and securely closed by magnets. 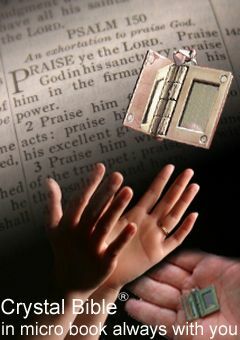 It will be delivered In full set with the interactive DVD. You can wear as a pendant or handle with a chain in your bag, or with your keys, etc. 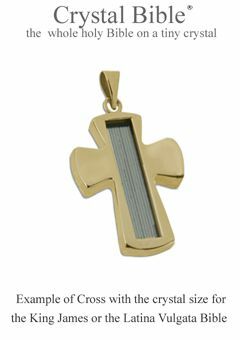 One face is free to be engraved by your local engraver shop with a name and any date as a baptism's date, a wedding's date, a communion's date, or any Church organization or any brand. 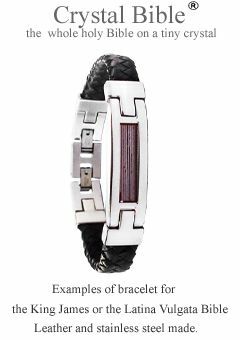 A beautifully crafted Crystal Bible® bracelet. 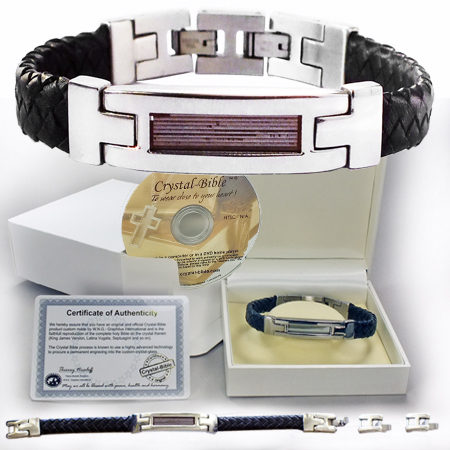 The high class of the black leather mixed with the stainless steel, In full set with the DVD. Size is adjustable by two removable lockets parts, length from 175mm to 210mm (6.87" to 8.26"). 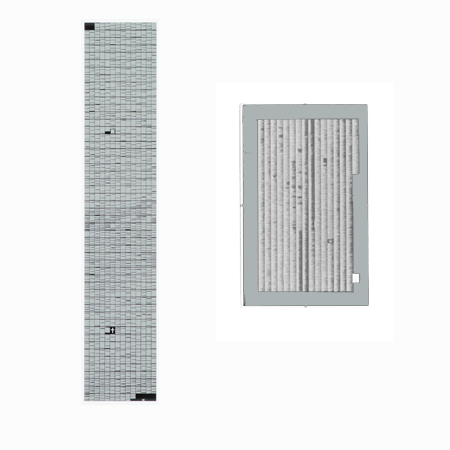 This product is under production development, to be informed, click on the button. 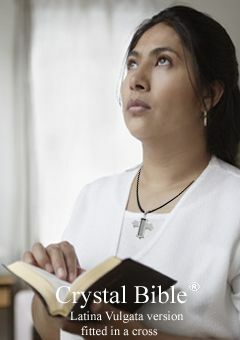 Others Crystal Bible® items coming soon. 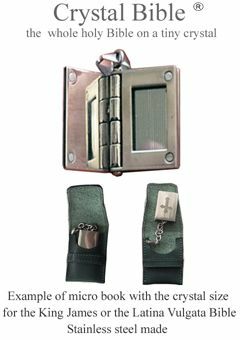 Products range is under production development, to be informed, please click on the button at the right.